Pittsburgh is transforming into a diverse food city that has something for everyone. 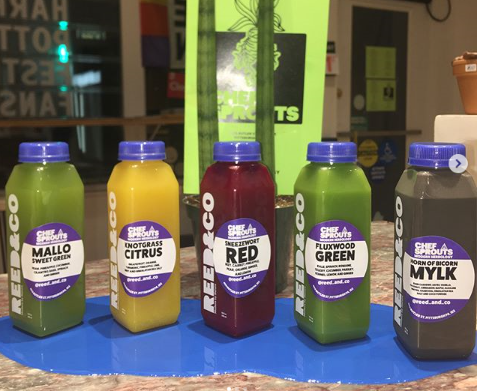 REED & CO is a fast-casual spot specializing in juices and light fare with a vegan focus. This wholesome, animal product free restaurant has been providing Lawrenceville with fresh, quick eats since 2016, and was designated Gold with the Sustainable Pittsburgh Restaurant program the following year. Their flavorful and inspired menu is bursting with a colorful bounty of vegan treats that not only taste delicious but fuel your body with essential nutrients that promote natural energy. Their juices and many of their menu items are prepped and packaged daily for freshness and convenience. You can even return the used containers back to them to be recycled. Whether you want to grab a quick fruit smoothie on your way to work or enjoy a meatless burger for lunch, REED & CO has your vegan fix. Owner Reed Putlitz is committed to running his business in the most sustainable way possible and is implementing new practices to take their Sustainable Pittsburgh Restaurant designation to new heights. REED & CO emphasizes responsible sourcing to provide high quality products. They source half of their produce from local sources and a staggering 90% of their ingredients are certified organic. The shop also offers educational sessions for the public centered around healthy eating and real-world skills to promote a healthier community. REED & CO looks for useful ways to limit the waste they produce by donating the pulp left over from the juicing process to Shadyside Worms and they also work with local businesses to produce baked goods and dog treats with the remaining pulp. To learn more about their sustainability efforts, you can view REED & CO’s profile and read their complete designation report. Looking for some healthy, vegan chow? Head to 4113 Butler Street in Lawrenceville. Open daily, 12pm to 6pm Monday, 10am to 6pm Tuesday through Friday, 10am to 6pm on Saturday, and 10am to 4pm on Sunday.